A striking beauty greets visitors to the nearly abandoned villages of the Russian North. Remote and forbidding, the White Sea is the primary geographical feature of the Russian North. For centuries its natural bounty has supported those hardy souls willing to endure the severe climate. Along its rocky western shore cling ancient fishing villages that consolidated Moscow’s hold on this boundless terrain. A number of these villages, with their soaring log churches, still remained at the beginning of the 20th century, but the modern age has dealt harshly with them. Most of the churches have vanished, and the few that have survived remain at risk. Perhaps the most picturesque of these villages is Kovda, located near Kandalaksha Bay, an arm of the White Sea in the southwestern part of Murmansk province. The village is perched on rocky cliffs above the point where the small Kovda River flows into the Startsev Inlet. The population of Kovda is officially listed as 20 (in 2010), with the addition of a few visitors in the summer. The few log houses that remain have carefully tended gardens carved into the hillside. Strings of dried fish, cured by the sun, are suspended along the sides of log walls. A few sheds and log saunas complete the picture in this craggy yet stunningly beautiful landscape. At the beginning of the 20th century, Kovda was a bustling commercial center, with a customs station, biological research station and a number of sawmills, including one English and another Swedish. Remnants of those enterprises survive in the neighboring settlement of Lesozavodsky (“Sawmill”) and Zelenoborsky. The building of the Murmansk Railroad inland from Kandalaksha Bay during the First World War diminished Kovda’s activity in favor of the railroad town of Kandalaksha, some 15 miles to the north. Although Kovda dwindled, it retained its primary historical monument, the small log Church of St. Nicholas with an adjacent bell tower. A church had existed on the site as early as the 15th century, but the present structure dates from the beginning of the 18th century, when the bell tower was also built. At that time, the church was surrounded by a cemetery, which was enclosed in a low log wall. To get to Kovda take the train from Moscow to Murmansk (Leningradsky railway station) and get off in Kovda (departure on 10.20 pm every day; travel time - 30 hours). The plan of the St. Nicholas Church is modest, with an apse containing the altar in the east. The main part is a square structure with a double-pitched roof. At the top is an unusual squat cupola with a small nob supporting a cross. The entrance is at the west end through a vestibule that is wider than the central component and built of thicker logs. In this primitive design the two components are not linked structurally. Like most wooden churches in the 19th century, the St. Nicholas Church had plank siding, which was removed during the Soviet period. Closed in 1960, the church was finally slated for restoration as a cultural monument in the 1990s. The bell tower was rebuilt in a simplified form, and restoration of the church itself began in 2003, albeit with frequent halts and sharp disputes. The church now has rather artificial-looking plank siding, but at the beginning of this century, it was still possible to see the original log structure. Farther south along the White Sea coast, the steep rocky outcroppings give way to salt marshes. In this setting, just over 250 miles south of Kovda, stands another coastal village with a miraculously preserved log church. The village of Virma is located near the mouth of the Virma River, some 22 miles to the southwest of the town of Belomorsk, the northern terminus of the White Sea Canal in the Republic of Karelia. The 2010 census gives Virma a population of 22 souls, which makes it a full 10 percent larger than Kovda. The village’s few wooden houses seem to float in the grassy marsh. 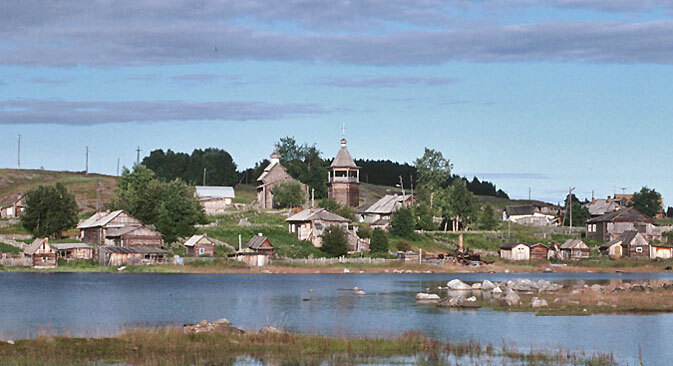 Like many other villages in the western part of the White Sea, Virma had for centuries been within the orbit of the great Transfiguration Monastery on the Solovetsky Archipelago. Although the relationship was frequently contentious, these villages provided goods and labor, while the monastery attended to their spiritual needs. The dominant landmark is the village church, built perhaps as early as 1625 and rebuilt in 1759. Dedicated to Saints Peter and Paul, the archaic structure rises like a living, organic form among the firs and other conifers that crowd the narrow coastline. Unlike the Kovda church, the Church of Saints Peter and Paul has no bell tower. In compensation, however, it has a remarkable crown of five cupolas covered with silvery aspen shingles and surmounted with wooden crosses. The dramatic thrust of the cupolas rests on a distinctive flared roof - also clad in wooden shingles. The roof rests above the ledge of a projecting cornice that protects the log walls of the square main structure from excessive moisture. As in the best examples of Northern wooden architecture, function and beauty coexist in graceful harmony. On the east is an apse crowned with the barrel gable, while the west part of the church consists of the usual low vestibule that could be heated for worship during the long winters. A small covered porch completes the linear design. The interior is being slowly refurbished as the church returns to active use. Few parishes can claim a lovelier place of worship.